Set up Asia Miles Time Deposit with HKD1,000,000 New Funds to earn 238,000 Asia Miles. 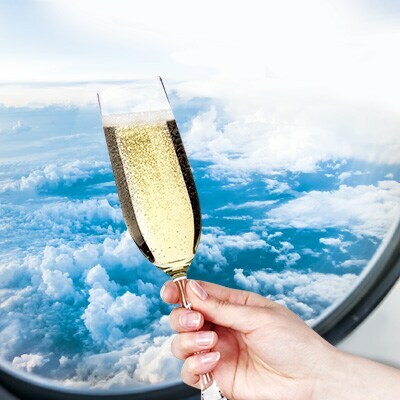 From 11 February to 30 April 2019 (“Promotion Period”), both New-to-Bank and existing clients can fly sooner by earning 238,000 Asia Miles¹ (‘Miles’) with HKD1,000,000 new funds in one go with Asia Miles Time Deposit Rewards, or open an Asia Miles Savings Account to enjoy 1% p.a. preferential savings interest rate & 5,000 Miles1 on a monthly basis with fund withdrawal flexibility. Other foreign currency time deposit offers are available. Rewards based on the quotation on 1 February 2019. For the latest offer and other details, please contact our branch staff or click here to visit our Asia Miles Time Deposit Rewards page. 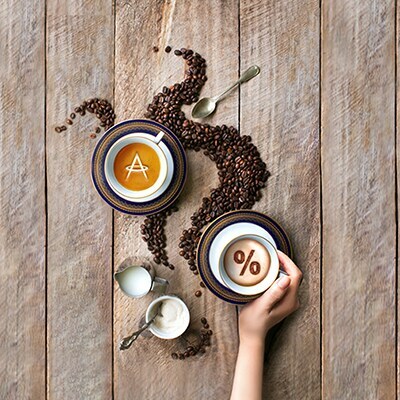 For the Asia Miles Time Deposit Rewards, the interest rate will be at 0.01%p.a. The entitled Asia Miles are tiered in terms of the tenor of Asia Miles Time Deposit, i.e. 6-month or 12-month, and calculated on a pro-rata basis according to the principal amount of Asia Miles Time Deposit. ^The minimum deposit amount to set up Asia Miles Hong Kong Dollar Time Deposit is HKD100,000 for new funds and HKD1,000,000 for existing funds. The earlier you set up the account, the more interest and Miles you earn8,9,10. United States Dollar Asia Miles Savings Account is also available. Remarks: Rewards Period starts from the calendar month following the month in which the Hong Kong Dollar Asia Miles Savings Account is opened and ends on 31 October 2019. If the minimum monthly average balance requirement of HKD100,000 in the Rewards Period is fulfilled, the Asia Miles entitlement will be calculated in a ratio of HKD200 monthly average balance in that account to 1 Mile. 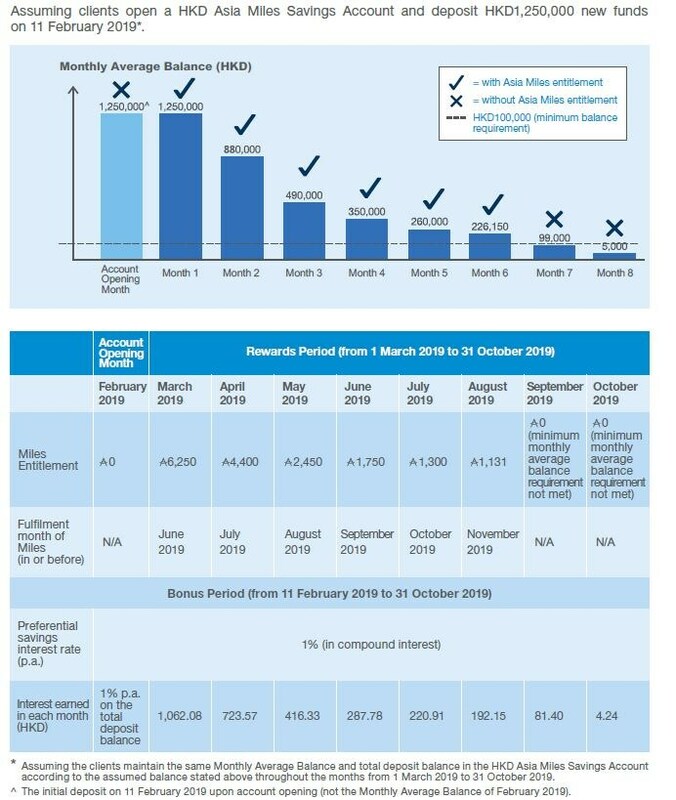 Interest entitlement during the Bonus Period, which is from the successful account opening date to 31 October 2019, will be calculated based on the total deposit balance of the HKD Asia Miles Savings Account at the HKD preferential savings interest rate in compound interest and on a 365-day or 366-day basis (for leap year). *Applicable for Asia Miles Savings Account opened in February 2019 and Rewards Period starting from March 2019. From 1 January to 31 March 2019, become a new Priority Banking Client and fulfil new funds requirement of HKD1,000,000 to enjoy extra 25,000 Miles, please click here for more details; or extra 4,000 Miles upon Premium Banking sign-up with HKD200,000 new funds, please click here for more details. From 1 January to 31 March 2019, you will be rewarded with up to 20,000 Miles per each successful referral of Priority Banking new client and up to 5,000 Miles per each successful referral of Premium Banking new client. The more referrals you make, the more rewards you will enjoy. Remark: The above entitlements will be fulfilled in the respective fulfilment period. The above illustration and examples are calculated based on assumptions and for reference only. In order to enjoy the Asia Miles Time Deposit Rewards (“AM TD Rewards”) and/or Asia Miles Savings Account Hybrid Rewards (“AM SA Hybrid Rewards”), you must have a valid Asia Miles membership account. Otherwise, you have to set up an Asia Miles membership account through Asia Miles Limited. You must successfully register online within 2 weeks after the setting up of the Asia Miles Time Deposit Account (“AM TD Account”) and/or the HKD Asia Miles Savings Account (as “HKD SA” defined below) and/or the USD Asia Miles Savings Account (as “USD SA” defined below) (as the case may be) with a valid Asia Miles membership account in your own name and other details as required via Standard Chartered Online Banking sc.com/hk/login. The amount of Asia Miles and the preferential savings interest rate as shown on the relevant promotion webpage and materials are for reference only and are not guaranteed. We reserve the right to make any adjustment to the amount of Asia Miles and the preferential savings interest rate as shown on the relevant promotion webpage and materials from time to time at its sole absolute discretion. The AM TD Rewards include both 0.01% p.a. interest rate on the AM TD Account and Asia Miles upon fulfilment of all relevant requirements in the relevant terms and conditions. For AM TD Account in HKD, the interest will be calculated in simple interest and on a 365-day or 366-day basis (for leap year). For AM TD Account in other currencies, the interest will be calculated in simple interest and on a 360-day basis. Early uplift of the Asia Miles Time Deposit is subject to the Bank’s discretion and penalty. Relevant AM TD Rewards are applicable on the date when the AM TD Account is successfully set up with Funds in the AM TD Account. For more enquiries, please approach our branch staff. The amount of Asia Miles that you may be entitled to for AM TD Rewards depends on the amount and the type of the Funds deposited into the AM TD Account successfully. If you wish to enjoy the AM TD Rewards from both New Funds and Existing Funds, separate AM TD Accounts should be set up for each Funds type as the amount of Asia Miles that you may be entitled to for different Funds types may not be the same. “New Funds” refers to (i) monies newly deposited into the Bank within 3 days before the opening date of the AM TD Account via cash, cheque, cashier’s order, Local Bank Transfer Payment through Real Time Gross Settlement (RTGS, also known as Clearing House Automated Transfer System (CHATs)) or Telegraphic Transfer from other banks or (ii) funds converted from any currency into the relevant currency of the AM TD Account on the same day of the opening of the AM TD Account, excluding any renewal or rollover of existing time deposits, transfer of funds from any account within the Bank, any currency converted from Premium Deposits, Structured Deposits and Currency Switching upon maturity. “Existing Funds” refers to any monies in your account(s) with the Bank other than New Funds as defined. in case if you open a HKD SA, (i) deposit at least HKD100,000 HKD Savings Account New Funds as initial deposit into your HKD SA at the time of account opening, and shall not exceed HKD10,000,000 and(ii) maintain a minimum of HKD100,000 Monthly Average Balance in your HKD SA during the Rewards Period for the Asia Miles entitlement. in case if you open a USD SA, (i) deposit at least USD10,000 USD Savings Account New Funds as initial deposit into your USD SA at the time of account opening, and shall not exceed HKD10,000,000 equivalent and(ii) maintain a minimum of USD10,000 Monthly Average Balance in your USD SA during the Rewards Period for the Asia Miles entitlement. “HKD Savings Account New Funds” or “HKD SA New Funds” refers to (i) HKD new funds in excess of the total deposit balance in all your HKD Eligible Account(s) at the Bank as of 31 January 2019 or (ii) funds converted from any currency into Hong Kong Dollar (HKD) on the same day of the opening of the HKD SA, excluding transfer of funds from any account within the Bank, any currency converted from Premium Deposits, Structured Deposits and Currency Switching upon maturity. “HKD Eligible Account(s)” means any of the following accounts that you have with the Bank which is valid and existing: HKD Time Deposit Account(s)/HKD Savings Account(s)/HKD Current Account(s) (including HKD Statement/Passbook Savings Account, HKD Marathon Savings Account, Click-a-Count, Bonus Payroll Account, HKD My Dream Account and any HKD savings sub-account and HKD current sub-account under an Integrated Deposits Account), excluding any MortgageOne® account and any joint name account of which you are not the primary account holder. “USD Savings Account New Funds” or “USD SA New Funds” refers to (i) USD new funds in excess of the total deposit balance in all your USD Eligible Account(s) at the Bank as of 31 January 2019 or (ii) funds converted from any currency into United States Dollar (USD) on the same day of the opening of the USD SA, excluding transfer of funds from any account within the Bank, any currency converted from Premium Deposits, Structured Deposits and Currency Switching upon maturity. “USD Eligible Account(s)” means any of the following accounts that you have with the Bank which is valid and existing: USD Time Deposit Account(s)/USD Savings Account(s)/USD Current Account(s) (including USD Statement/Passbook Savings Account, USD Marathon Savings Account, Click-a-Count, Bonus Payroll Account, USD My Dream Account and any USD savings sub-account and USD current sub-account under an Integrated Deposits Account), excluding any joint name account of which you are not the primary account holder. The AMSA Hybrid Rewards are composed of Asia Miles AND a preferential savings interest rate upon fulfilment of all relevant requirements in the terms and conditions. The Asia Miles entitled will be calculated based on the Monthly Average Balance of the HKD SA and/or USD SA (as the case may be) during the Rewards Period and the interest calculated based on the total deposit balance of the HKD SA and/or USD SA (as the case may be) at the preferential savings interest rate during the Bonus Period. Interest of the HKD SA during the Bonus Period will be calculated based on the total deposit balance of the HKD SA at the relevant preferential savings interest rate, and will be calculated in compound interest and on a 365-day or 366-day basis (for leap year).Interest of the USD SA during the Bonus Period will be calculated based on the total deposit balance of the USD SA at the relevant preferential savings interest rate, and will be calculated in simple interest and on a 360-day basis. Apart from the funds initially deposited into the HKD SA and/or USD SA at the time of the opening of the HKD SA and/or USD SA (as the case maybe), further deposit to the same HKD SA and/or USD SA by any means are not allowed on or before 31 October 2019. Deposit withdrawals from the HKD SA and/or USD SA(as the case maybe) are allowed during the Bonus Period with respect to the minimum monthly average balance requirement to enjoy the AM SA Hybrid Rewards. Asia Miles Limited will credit the Asia Miles that you are entitled to into your registered Asia Miles membership account within three months from the date of opening of the AM TD Account and/or within three months after each calendar month of the Rewards Period for AM SA Hybrid Rewards. If the average daily Relationship Balance of the Priority Banking client within the quarter falls below HKD1,000,000, a maintenance fee of HKD900 will be charged for the quarter. If the average daily Relationship Balance of the Premium Banking client within the quarter falls below HKD200,000, a maintenance fee of HKD360 will be charged for the quarter. For details, please refer to the Service Charges booklet and Banking Terms & Conditions which can be obtained at any of our branches or at website sc.com/hk. For the welcome privileges of Priority Banking / Premium Banking sign-up, eligible clients must successfully submit accurate Asia Miles membership information via the designated webpage(s) of Standard Chartered Bank (Hong Kong) Limited within the period from 1 January 2019 to 30 April 2019 (both dates inclusive). Relevant Asia Miles will be credited directly to the eligible clients’ Asia Miles membership account. Terms and conditions apply. Investment involves risks. For details of specific offer, risk disclosure statement, important note on deposit protection scheme and health warning statement, please refer to the relevant promotional leaflet or contact our branch staff for details.